Come to the meeting tomorrow from 4-7 at 841 N Broadway. There will be a short formal presentation at 5pm. 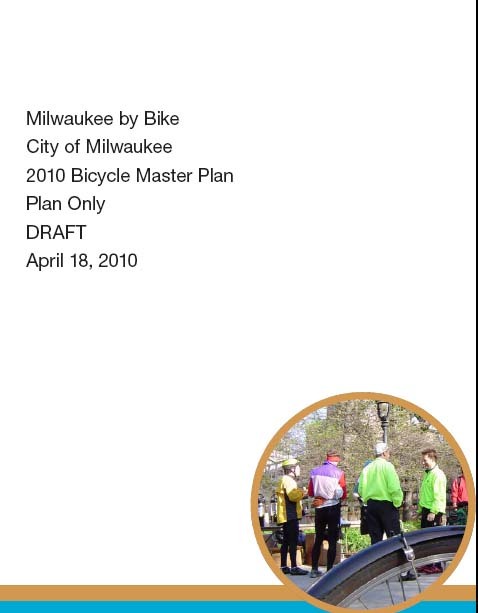 This is the second in a series of posts in which I dissect some of the bigger proposals in the City of Milwaukee Bicycle Master Plan. The total plan is more than 200 pages if you include the appendices, so some people might balk at reading it. These posts are designed to place a microscope on a few of he most revolutionary suggestions in the draft plan. Again it is important to remember this is a DRAFT plan that still needs a final revision and approval by the Common Council to carry any water. Raised bike lanes are another effort to attract people who like to ride bikes, but don’t enjoy riding with traffic. As the plan notes, some 49% of Milwaukee residents ride bikes, but only a bit over 1% of trips to work are taken by bike. It is pretty safe to estimate then that about 2% of all trips are made by bike. So 50% of people ride bikes, but the vast majority of them only ride for recreation. When asked why, most people answer they don’t bike more because of fear of motor vehicle traffic or because of a lack of dedicated bicycle facilities. The City has 52 miles of bike lanes and plans (and funds) to just about triple that number. Many people who want to ride still won’t if all they have are bike lanes. Bicycle Boulevards are one proposed facility option in the bike plan that should attract some of these traffic averse people, but we can do more. 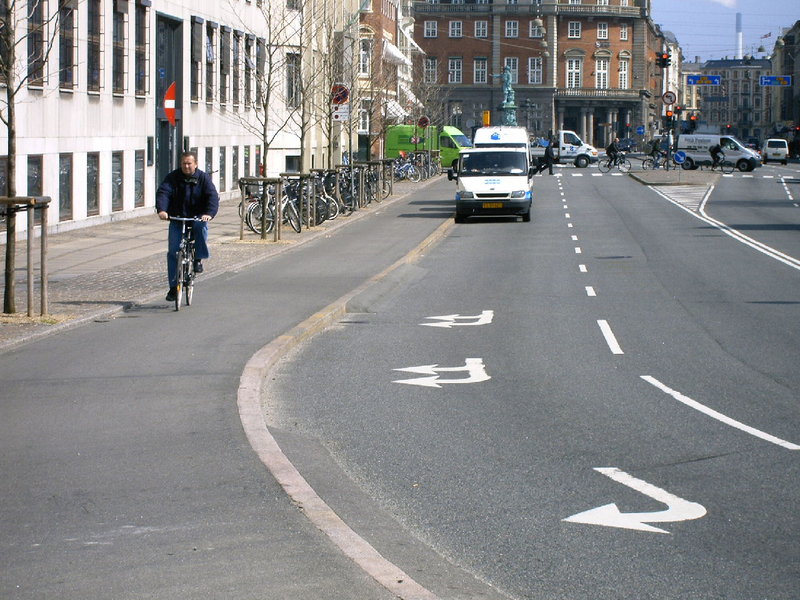 This is a photo I took of a raised bike lane on Holmens Kanal in Copenhagen (I don't remember, help anyone?). Note they use vertical curb rather than rolled curb because bikes are not allowed in the motor vehicle travel lanes. In Europe, many countries like Denmark and the Netherlands have constructed slightly raised bike lanes sometimes called cycletracks. Cycletracks have some elements that the proposed raised bike lanes do not. I will discuss the proposed Milwaukee cycletracks in a future post. For now, lets consider what a raised bike lane might look like in Milwaukee. The slightly elevated bike lane and rolled curb add a bit of separation between the moving motor vehicles and the bicycle. Note you can’t just do this anywhere, there are several caveats. First, you need to have sufficient roadway width or cross-section. If you have only one MV travel lane, you need this minimum: 2(11ft + 1ft + 6ft + 8ft) = 52ft. This is not a very common roadway width in Milwaukee. Most roads with one MV travel lane in each direction and on-street parking are 50ft wide, which allows for normal bike lanes because you don’t need the rolled curb width or the extra bike lane width (to avoid doors on the raised lane). A typical cross-section on a Milwaukee road with bike lanes is 2(12ft MV travel lane, 5ft bike lane, 8ft parking lane) = 50ft. You have to have that width or more to put in bike lanes, and you need a bit more width for raised bike lanes. It is more likely that raised bike lanes could be installed on median divided multi-lane roads like Fond du Lac. In those cases you can steal a tiny bit of width from the center medians if you choose to. But often median divided roads like that have 34ft-36ft cross sections on each side (12ft MV lane + 12ft MV lane + 12ft wide outside parking lane). Roads like this are constructed with this cross-section so a third lane can be added if traffic volumes grow enough to demand it. In the mean time, they make decent bike routes from a width standpoint, but not from a traffic volume/traffic speed standpoint. A raised bike lane would give people riding bikes a bit more confidence. It is rare that Milwaukee would not have on-street parking, but this could be a way to install raised bike lanes on such a road. Again, this image comes from the plan and was created by Alta Planning + Design. A second problem is drainage. Because roads generally have a crown and a curb face that tops out at the sidewalk level, you need to modify the catch basins with laterals and may need to fully reconstruct the curb and gutter. This makes them a bit expensive to engineer and construct and means you can’t always retrofit them to any road with a simple resurfacing project. These would be best to install on full reconstructs, or using a federal grant to offset the local cost. Even so, the City is taking a look at a couple upcoming projects in the next year or two to see if we could make raised bike lanes work. If you want to try riding on something very like a raised bike lane, pedal out the recently recontsructed section of State Street in Wauwatosa between just west of the Hawley Rd bridge and 68th St. If you go on a Sunday, the perpendicular parking lanes on the south side of the street work just like a raised bike lane. If ‘Tosa ever removes that parking and puts it behind Grede Foundry, they could use this parking lane just like a raised bike lane or perhaps more like a two-way cycletrack. But cycletracks are for another post at a later date. I hope to see you tomorrow at the Public Information Meeting for the draft bike plan. Stop by any time between 4pm and 7pm at 841 N Broadway, 1s floor conference room. I will give a short presentation at 5pm and the consultants will also be there to answer questions. Dave, thanks for all of the hard work! I’m excited! Dave, Perhaps an odd question on a 90+ degree day, but how does the proposal envision clearing snow off the cycletracks? My concern is that the ice and snow from the road will pile up onto the cycletrack, and the width of the cycletracks will not only become narrower but throughout the winter will become increasingly more treacherous for commuters. However, I still wish some of these endeavors could be proposed & implemented in more parts of Madison, too! No worries about that. I checked with Wauwatosa and they have no trouble plowing their raise area. All bike lanes sort of narrow in winter where we don’t have enough ROW behind the curb for snow storage. But our official policy in Milwaukee is to plow curb to curb, so bike lanes should in theory be clear in winter. Snow clearing of sidewalks and trails remains a slippery issue and one we are working on at the City. is the presentation at 5 or 5:30? i’ve seen both. The new plan is looking really great. Raised bike lanes, or segregated lanes of some kind, would be really useful in Walker’s Point and Downtown where you often have to ride down busy, fast multi-lane streets to get from one side of the city to another. They’re really popular here in Copenhagen (where your picture is from, by the way- Holmens Kanal is the street to be specific) and make it possible to bike everywhere (literally) in the city, also along busy highways in the ‘burbs, safely. Thanks for the blog, too. It gives us Mke expats hope of returning to a truely liveable hometown someday. Mange tak for the comments from Copenhagen. Having been there it is hard for me to compare the two cities in any real way when it comes to bicycles (or transit). We still have good friends there and I hope to get back there next summer. If you do return to Milwaukee, please do look me up at work. Milwaukee can use all the people who truly understand the potential the bicycle has to make a City more livable. PS What’s with the big concern with street width in Milwaukee? Here they sometimes just make narrower lanes or sidewalks to install bike facilities. Shorewood used the same excuse for not extending the bike lanes when they redid Oakland a few years ago. The new “complete street” redo ended up making it a lot harder to bike or bus there so that the soccer moms would feel more comfortable power walking (curb bump outs in front of bus stops are a really bad idea, for example…). In the US we have pretty strict standards for travel lane minimum width. Eleven feet is standard, but 12 ft is preferred. We can sometimes argue that 10ft will work if we have low truck volumes and no buses on the roadway, but even then it is a difficult sell. Our State Dept. of Transportation and the Federal Highway Administration have to approve all our roadway designs that involve federal funds, which is every street we would put a bike lane on.